In 1801 the Northwest Territorial government approved the Grade Road from Dilles Bottom at the Ohio River to Jacobsburg, then along the ridge tops to Barnesville and Pultney Ridge to just east of Old Washington, Ohio. The grade up from the river was gentle and a much easier route for westward pioneers than the rugged climb up from the Wheeling area to St. Clairsville. This road was popular but did not get improved as the Zanes Trace which became the National Road. This improvement called for toll charges and the stones in the deep wagon ruts caused hoof discomfort to animals being driven (droved) to the east. The Grade Road became the drovers choice of routes eastward for hundreds of thousands of animals on the way to the Baltimore, MD market. Animals on this route were cared for at drovers stations. The Grade Road became known as the Drove Road and from Jacobsburg to Barnesville it has become State Route 147. Some deep grooves still can be seen along sections along SR 147. Cattle, Horses, Mules, Hogs, Sheep, even Turkeys traveled this route until about 1875 when railroads became competitive. A three year effort to illuminate the importance of the history of the old drove road has finally resulted in the Ohio Department of Transportation recognizing it through the Ohio Scenic Byways program on September 19th, 2003. Mr. Gordon Proctor, ODOT director has proclaimed the official acceptance of the "Drovers' Trail Scenic Byway" as Ohio's 16th Scenic Byway. The Drovers' Trail Scenic Byway gives our community an opportunity to showcase the interior part of Belmont County from Bellaire to Barnesville on SR 147 and connect to Hendrysburg on old US 40 for a 39 mile scenic route that will take the traveler over much of the old route the drovers took when drovers took their livestock from the frontier to Baltimore, MD a century and a half ago. 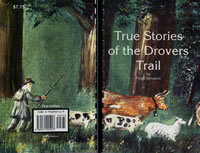 The illustrated book, True Stories of the Drovers Trail was a limited edition book. It is currently sold out in hard copy form but it is available as a pdf file as a download from our Gift Shop section. The book provides details of the history of the drove road in eastern Ohio. The book tells of the pioneer settlements, early farming techniques (Why were barns painted RED?) and the basic need to move livestock to market so the farm would have enough capital to buy the things needed like; window glass, metal hinges, gunpowder, gingham dress for mama, etc. Some interesting facts are explained like, how do you shoe turkeys? And why would you? Have you ever wondered how the early drovers managed to feed their animals on a three hundred mile trip to market and not walk the fat off em (They actually gained weight on the way). The droving of the early 1800s lasted for three quarters of a century through eastern Ohio. It was an art that was copied to some great extent in the west when cattle were droved from Texas to the markets or railheads in the north. Droving in pioneer America held many dangers, loss of livestock due to predators, theft, even murder. These are true stories of the drovers trail, taken from stories handed down from father to son, letters from drovers, and articles written at this interesting period of our American history. You can buy the pdf version with Pay Pal or your credit card, please see our Gift section to order. Floyd Simpson, author and illustrator.